GREATER TORONTO – According to the Toronto Real Estate Board (TREB)’s latest Market Watch report, July 2014 was an exceptional month for Toronto real estate, yielding an incredible 9,198 reported property sales. This impressive figure – the second-strongest July sales result on record – reflects an equally awe-inspiring 10 per cent year-over-year increase. The average price for GTA properties enjoyed its own year-over-year increase of 7.5 per cent, reaching $550,700 for the month. According to the TREB report, that price growth was strongly led by the detached home market – which experienced a remarkable average price increase of 11 per cent in the GTA’s competitive 416 neighbourhoods. Suburban Toronto accounted for much of July’s increased sales activity, with condos in the 905 reporting a year-over-year sales activity increase of 14.6 per cent. Detached homes in the 905 – which accounted for the majority of July’s suburban sales, with 3,393 – reflected their own impressive year-over-year increase of 11.1 per cent. Nowhere in the GTA were July home values stronger than in York Region, where an average price of $673,329 demonstrates even higher home values than the hotly-contested neighbourhoods of Toronto Central – where the average price for July sat about 2.5 per cent lower, at $656,226. This bucks a small-sample trend – as York Region has had a lower year-to-date average price ($674,140) than Toronto Central’s ($725,301). 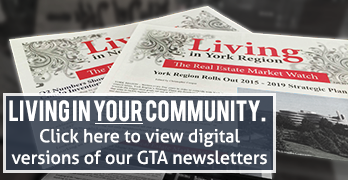 To better understand York Region’s outstanding price performance, GTA Real Estate News caught up with Living Realty Inc., Brokerage’s Woodbine branch manager (and publisher of the Living in York Region newsletter) David Wong. Wong added that, with an average July property price of just $490,510, Peel Region remains an ideal option for first-time buyers seeking an older or more affordable low-rise home. With 2014’s red-hot GTA real estate market exceeding expectations after a long winter, TREB senior market analyst Jason Mercer is optimistic about its performance over the remaining months of 2014. “Strong demand for ownership housing will underpin robust average price increases for the remainder of 2014,” noted Mercer.